It’s the eve of New Year’s Eve. In another 2 days, a new year will be upon us. I always get a bit nostalgic during this time of the year. It’s like I’m trying to grab the last few hours before the year ends to think and reflect on what has happened, or didn’t happen, this whole year. As I looked through my Flickr folders, the nostalgia dipped one notch further when I looked at my food photos taken at New Formosa Restaurant. Wayyyy before I started food-blogging, this restaurant has been one of my favourites. I’ve been going to this place for my lunch for years (something like more than 16 years!). My top favourite lunch item here is their Seafood Porridge. I almost always order this on almost all the occasions that I have been here at lunch, usually with friends and colleagues. Their service crew recognise me by sight and they know what I want when I tell them “my regular order please!” The seafood porridge here is really the most delicious comfort food ever – piping hot smooth rice porridge brimming with fresh seafood – fish fillets, shrimps, clams, fishballs, squids, jellyfish… drizzle some soysauce and shake some pepper over the porridge and you’ll have a most fulfilling lunch – delicious in its simplicity. As much as I associate seafood porridge with New Formosa, their Stir Fried Butter Eel is another one of their signature dishes. Soft succulent eel fillets encased in a light crispy batter and delicately fried to a golden brown. 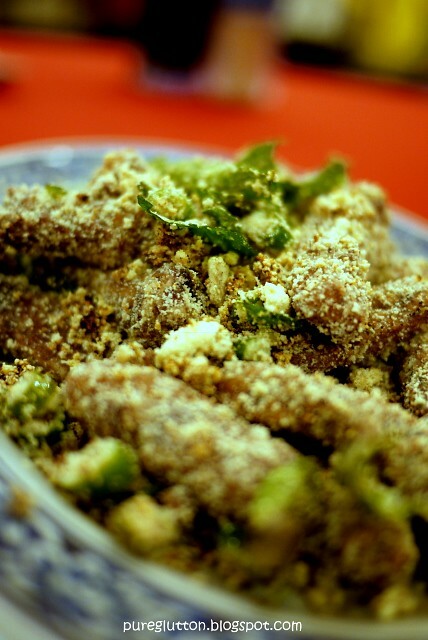 Curry leaves and bits of chilli padi give this dish that extra “ooomph”. Eat this with white rice or just by itself as an indulgent snack. At a recent dinner here together with my dear Kahcheh, we wanted something simple & light yet nourishing and immediately this item jumped up from their menu as our mutual choice – a delightful Tofu dish – braised with mushrooms, fungus and angled loofah. If you like innards, try their Pig’s Intestines with Pineapples. 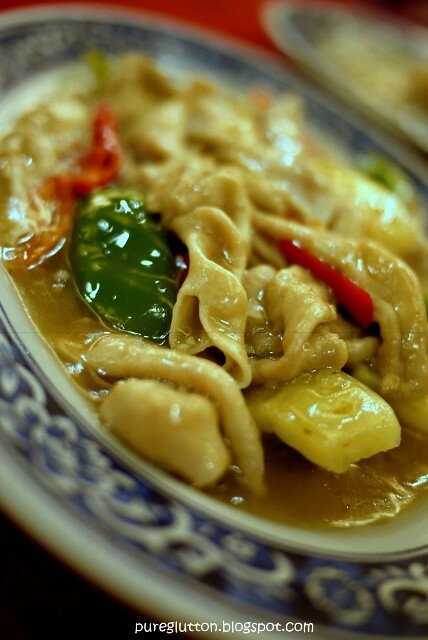 The tender intestines, cooked in a sweet sour gravy with chunks of pineapples and bell peppers were refreshingly different – the intestines were not fried , hence less oily & chewy. 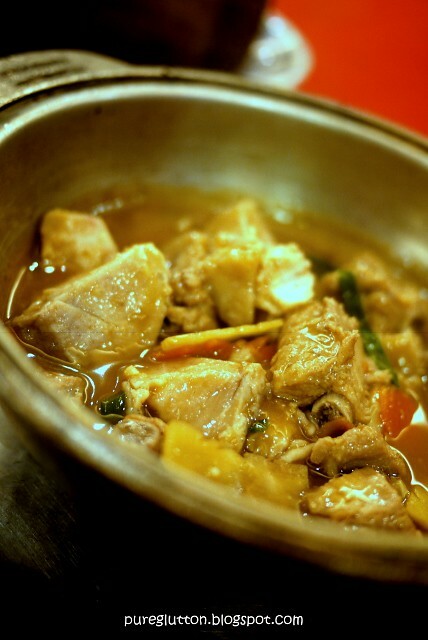 The gravy had none of the cloying sweetness of sugar overdose in typical chinese sweet-sour dishes. One of Chef Lee’s signature dishes – Bamboo Yam Rice – a must-try for carbs lovers. I just couldn’t resist this, more so when I was told there’re yam cubes in the rice. Yes, I’m a yam-lover. 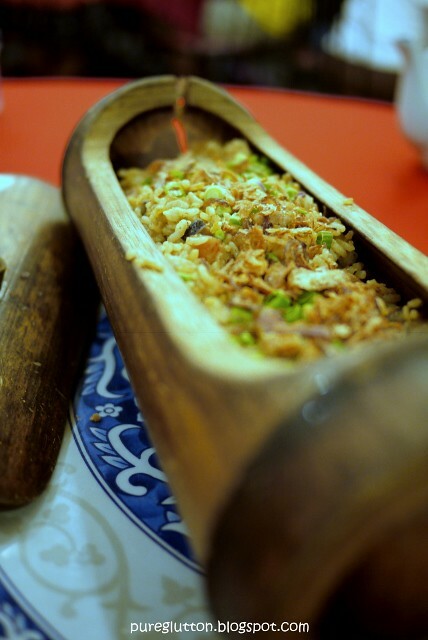 The rice was made more fragrant with bits of dried shrimps, fried shallots and chopped spring onions. I can just eat this alone. No need for any accompanying dishes, really. 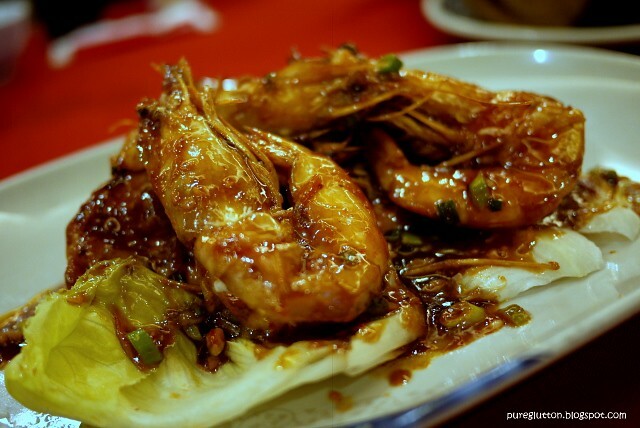 Huge succulent prawns cooked in their signature style. One word: divine. Pork Ribs braised with Yam. If we were not already so full, we would have asked for white rice to mop up the gravy, deliciously thickened by the soft powdery yam, divinely infused with porky lardy goodness from the tender ribs. In Mrs Lee’s books, we were not allowed to leave her restaurant without tasting their desserts. I love how the Taiwanese love their yams. Yams are a mainstay in their menu – in rice dishes, in main courses and even in desserts. 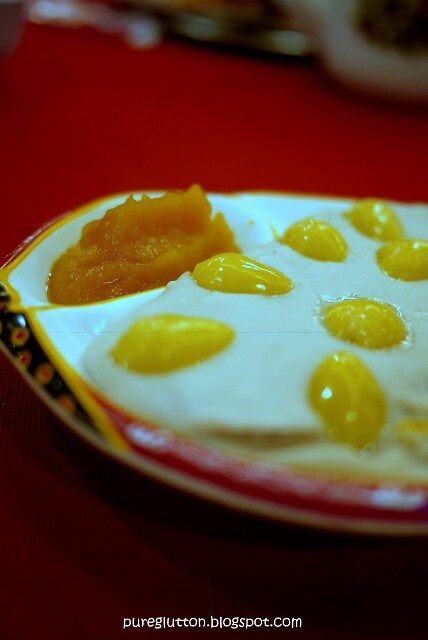 Their signature dessert: Pumpkin Yam Pudding with Gingko. I like their sans lard version. It’s definitely healthier and it made me feel less guilty indulging in this. It’s also very light on the sugar content: a definite plus point in my books. 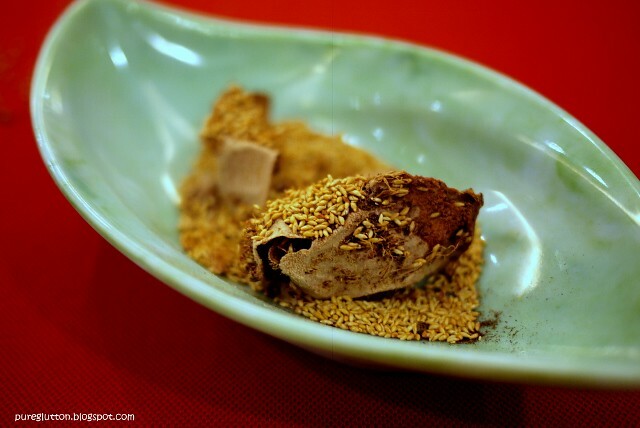 In New Formosa, one dessert is never enough. Go for a 2nd one. 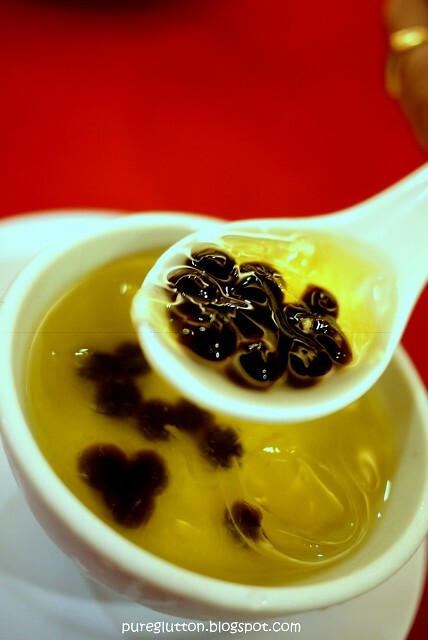 Go for their refreshing Aiyu Jelly – very light, very lemony, absolutely addictive. It’s fascinating to learn how Aiyu Jelly is made from the gel of seeds of a type of fig found mainly in Taiwan. By placing the seeds in a bag submerged in water and gently rubbing them, a slimy gel will be produced which is then allowed to set into a jelly. Sugar and lemon/lime juice are added in and there you have it – the yummy Aiyu Jelly! 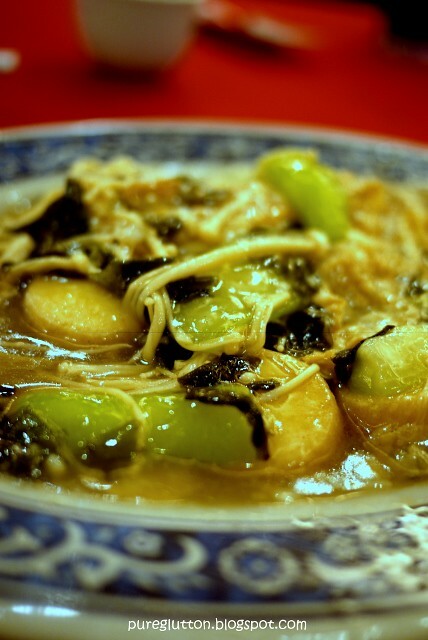 There are so many more well-loved authentic Taiwanese dishes on their menu to try. I think I want to go back there soon for my seafood porridge – I haven’t had it for some time. It used to be a favourite lunch item for me before my office relocated. New Formosa is located at the quieter part of SS2 – parking is not much of a problem – and that’s definitely another plus point. Wow. Didn't realise that New Formasa had been around for THAT long. Oooh, I enjoyed their Aiyu Jelly but didn't know it came from the seeds of a Taiwanese fig! Interesting.. It's like coming home each time we eat at New Formosa. It's always so good eating with people you love. I like the seafood porridge too, and the "chai" meen. Happy New Year! Yes, best Or Nee I have tried.